Your privacy is important. Your right to know what data is being used is equally important. If you are an End-user of a software that uses SoftMeter, you can find on this page the data that are used by SoftMeter. 2) get automatically alerted about bugs that you might run into while using the software. If you are a developer using SoftMeter in your application, you can include a link to this page from your software application, so that users can see what kind of data fields are involved. This transparency about the data and their usage is also required by the data protection laws and increases the trust of the end-users towards your software product. SoftMeter is a telemetry add-on to software applications. It allows the developers of software to "listen to the heartbeat" of their software and spot problems or find improvement areas. What data is being used by SoftMeter? SoftMeter uses a reduced set of data, similar to the data used when you visit a website. The data used by SoftMeter actually even less from what a typical website uses. SoftMeter data are completely anonymised and no personal information is part of it. Anonymised UserID E.g. User23409458923472396234.This field is randomly created (hash function) by SoftMeter, It is not linked to any other online activity of the user and is completely separated by other web statistics. Anonymised IP Your IP is not used. Instead an anonymised IP is used and the real IP never arrives to the developer. Country and city Approximate information with large margin of error. Software application name and version The name and version of the software that you have installed and are using on your computer. Used software functionalities Depending on the developers, specific functionalities of the software might be measured. E.g. if you select the "Print" function, the developers might have decided to receive a "Print event" notification, so that the popularity of the Print functionality can be assessed. Software crashes and problems Depending on the developers, when a problem or a crash is detected, they can receive a "Error" notification, like "Error while opening file". These notifications will allow the developers to focus and quickly fix the problem you have ran into. Here is an example of the statistics that the developers see from the usage of their software. 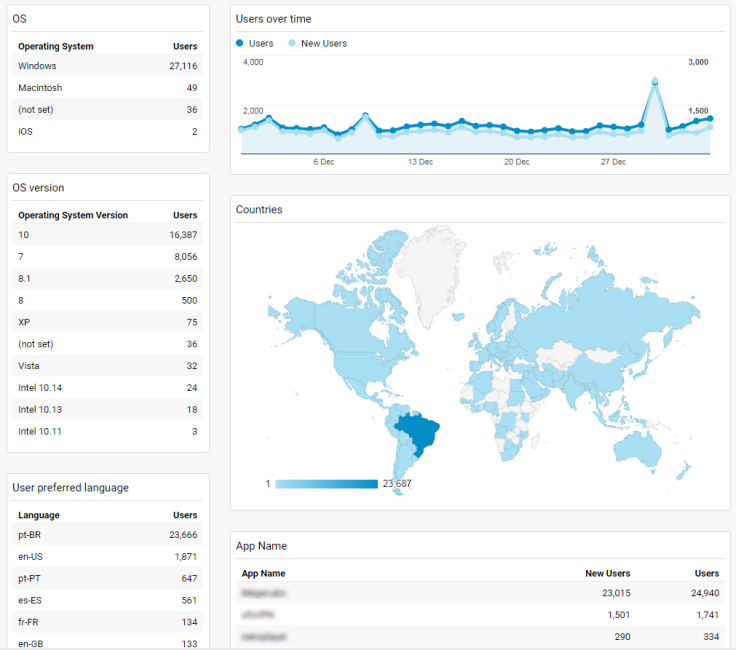 SoftMeter's reporting platform is Google Analytics. By using the reporting platform used by the majority of the websites, we are delivering a reliable and trustworthy product. StarMessage software SoftMeter SoftMeter maker. Has access to partial reports, to ensure proper use of the system. By "proper" we refer to both the technical manner but also the "ethical" / personal data protection dimension. Software developer Software A Maker of "Software A". Has access to all reports genarated by Google Analytics and using the above described data fields. Google Google analytics Provides the platform for the reports. As the UserID generated by SoftMeter is not related to UserIDs known by Google Analytics, there is no exploitabled information in the dataset.